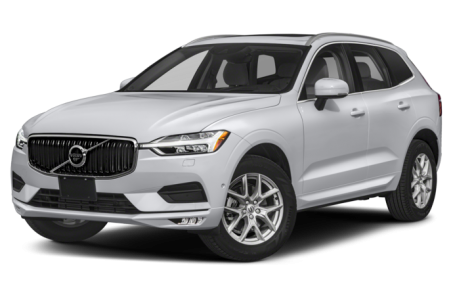 The 2019 Volvo XC60 is a compact luxury SUV that comes in two versions: the T5 and T6. Maximum cargo capacity is 17.8 cubic feet with the rear seat fold down. The T5 version is powered by a 250-hp, turbocharged 2.0-liter four-cylinder engine mated to an eight-speed automatic transmission. Front-wheel drive comes standard, while all-wheel drive (AWD) is optional. The T6 has a more powerful 316-hp, supercharged and turbocharged 2.0-liter four-cylinder engine. Fuel economy for the XC60 T5 is an EPA-estimated 22/28 mpg city/highway. It slightly lowers to a 21/27 mpg rating for the T6 version. Both the T5 and T6 have three trims available: the Momentum, Inscription, and R-Design.